Price: Rs. 189 on Amazon. 'The Devotion Of Suspect X' is one of the best mysteries that I have ever read. When my husband fell in love with Higashino's style of writing, I bought him all the books of this author that were translated into English for his birthday. This also happened to be one of them. While taking a break from reading Harry Potter, I decided to read this one. And with a couple of hours per day, I was done with the book in three days. That is the best part about Higashino's books. The writing is light and simple and doesn't get tedious. Although the book has 350 odd pages, reading it felt like a breeze. Kyohei, a fifth grader is on his way to Hari Cove to stay with his uncle Shigehiro Kawahata, his aunt Setsuko, and his cousin Narumi during his holidays. His uncle's family owns Green Rock Inn a little resort in the town of Hari Cove. Hari Cove is in danger, where a group wants to come in and mine the oceans around for crystals. While a certain set of people, led by Narumi wants to save the oceans and doesn't want the mining to go ahead, there are others who think that this is the only way the town can be known for something good. Also, this is expected to bring in more jobs to the folk of Hari Cove. Masatsugu Tsukahara, is here for the mining conference and so is Manabu Yukawa aka Detective Galileo. Both of them happen to be the only guests at Green Rock Inn. After the day of the conference, Tsukahara is found dead at the bottom of a sea cliff. While the local police are keen to close this case as an accident, Yukawa is not convinced. When the cause of death is determined to be carbon monoxide poisoning, Yukawa begins his own investigation with the help of Kyohei, who has no clue what is happening. When it is discovered that Tsukahara was retired from the Tokyo homicide, the Tokyo police also comes into the investigation along with the Hari Cove police. Tokyo homicide detective Shunpei Kusanagi and his partner Utsumi are back in action and with the help of Yukawa, they begin to decipher the case. As they dig deeper, they realize that Tsukahara came to Hari Cove not for the mining conference but to seek out Hidetoshi Senba, a man he’d arrested 16 years earlier for the murder of an unemployed nightclub hostess. Next begins the hunt for Senba to check what Tsukahara actually wanted from him. What made Tsukahara seek Senba after 16 years? And how is the Green Rock Inn related to all this? Why is Narumi so hell bent upon preserving the oceans? Where did the carbon monoxide that killed Tsukahara come from? Especially when the police were not able to replicate the crime scene. When all these questions are answered, you realize the complexity of the story and the twists that unfold in staccato bursts. The ending shall make you raise your eyebrows, but there is no other way you would want the book to end. This is the third book and case for Detective Galileo, the first being 'The Devotion Of Suspect X' and the second 'Salvation Of A Saint', which I am yet to read. A Physics professor with the mind of a genius. He picks up clues from a single sight and interprets it in his own complicated way which turns out to be the obvious later. He helps Kyohei with his homework and even has him do little detective tasks for him. While his intentions are clear, the fact that someone can be so nosy and smart at the same time is quite something. His analysis of the case if bloody brilliant. Kusanagi and Utsumi also do their share of work and together with Yukawa they solve the case. But just like the first book, the suspects and the alibis hold on to their secrets and the case is dismissed as an accident. But it is anything but that. Verdict: Brilliant twists and turns and the backtracking of the case is smart and well executed. Read it, read it now. I love books. Added this to my bucklist of 2017. Thanks for sharing !!! 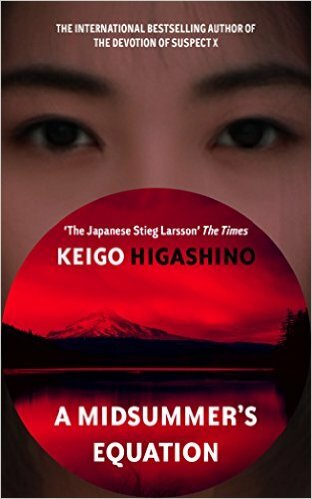 I have read Keigo Higashino's 3 books in the order of their release. I would rate The Devotion Of Suspect X and Salvation Of A Saint to be way more engrossing and thrilling than A Midsummer's Equation. You must check out his first 2 books too! I found all three to be mind blowing. I have the other two, will read them soon.